So a couple of people asked for my mom’s young radish top water kimchi recipe (Yulmoo Mool Kimchi or Moochung Mool Kimchi). I asked her, and she says “there really isn’t a recipe. You just go with the flow!” Which is funny, because that is really how Koreans cook. They really just cook with “Sonmaht – hand taste” like we talked about before. Anyhoo, I looked up a recipe on Naver’s cooking website, to share. I always find that it’s a pain that they use weight/grams instead of volume/cups to measure the ingredients! But better than no recipe! 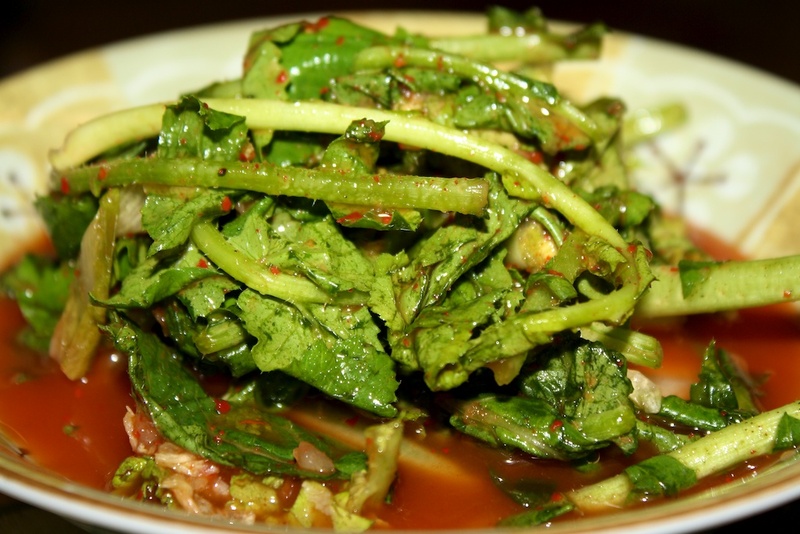 Just be aware, this radish top water kimchi is considered a very difficult kimchi to make. Only those who are highly skilled can make it. My mother always used to talk about how difficult water kimchi making was, and how her water kimchi would never taste like her mother’s even if she does exactly what her mother does. My grandmother makes really good water kimchi. 1. Use young small Korean radish (Yulmoo) tops and cut into 2 inch pieces and leave them in salt water until they wilt. 4. Add flour to water and boil while stirring so it thickens to a light paste. 5. In a big bowl, add radish tops and diced ingredients. Add salt and mix gently but thoroughly. Put into a glass container. 6. When the flour water paste is cooled off, add some salt to taste and add to the glass container! Enjoy and let us know if you succeed in making this difficult kimchi dish!!! Thanks Lu! It is so wonderful to be back after the long and tiring trip. Usually we have a very relaxing time in Seoul, but that was not the case this time! Yeah, the water kimchi is kind of difficult to make. I need to work up my confidence before I try again as well. I’m sure your kimchi was good! She must not be a very expressive person! So are you learning Korean right now? 네, 5년동안 한국어를 배웠어요. 그러나 아직도 잘 한국어 할수없어요. It’s sad! 🙂 I’ve learned a lot, and I’m okay saying things like that, but I freeze up in real conversations. I’m sure it’s a matter of practicing more. Lu, how cool. I am impressed!!! Thanks for the recipe! How long do you leave it in the jar until it is ready?